4 stars of angelic battle action on the layer! 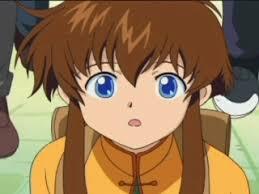 Angelic Layer is based on the manga series released by Clamp (Chobits). It is adapted to anime by Studio Bones (Fullmetal Alchemist, Noragami) and directed by Hiroshi Nishikori (A Certain Magical Index: The Movie – The Magic of Endymion). Originally released in 2001, it is presented here on Blu-ray, with Collector’s packaging and a 40 page booklet, plus other features, courtesy of Anime Limited. Misaki Suzuhara (Jessica Boone – Samurai Bride, Another) is a twelve year old girl, forced to move to the city of Tokyo to stay with her Aunt Shoko (Kelly Manison – Is It Wrong To Try To Pick Up Girls In A Dungeon?). Baffled by the bright lights and loud noises, the first thing she sees upon stepping off the train is a massive screen showing some sort of fight. Masaki is fascinated, as the victor is much smaller than her opponent, and being small herself she takes heart from this. 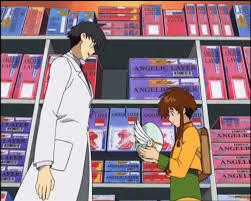 This is the first time that she meets the very strange white coated Icchan (Andy McAvin – Outbreak Company, Crying Freeman) who explains to her that what she sees is a game called Angelic Layer. Each player creates an Angel, which is then cast onto an electronic playing field known as the Layer, and controlled using the power of the mind. He takes her shopping to buy a starter kit and she immediately goes to her Aunt’s house and creates herself an Angel which she calls Hikaru. She soon discovers that her new friends Kotaro (Kevin Corn – D.N.Angel) and his young sister Makoto (Sasha Paysinger – Air) are also fans of the game, in fact Makoto and her Angel Suzuka are already champions. 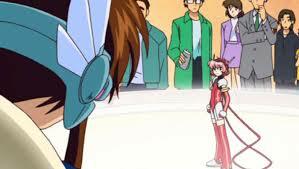 With help from Icchan, she gets her Angel Card and is entered into a tournament which would allow her to progress into the Regional and eventually National tournaments. Learning as she goes and adjusting to her new life in Tokyo, she works towards her goals with the help of her friends and rivals. 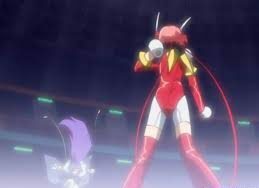 Angelic Layer is a very enjoyable anime, much more so than I expected. Rather than just being an endless stream of battles there is also a good storyline there, with relatable characters and plenty of comedic moments to offset the occasional serious ones. It manages to pack in plenty of healthy messages about teamwork, friendship and life in general without becoming moralistic and fans of fighting robots are sure to enjoy this one. Well worth adding to your collection. 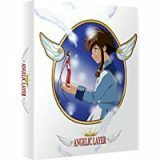 Angelic Layer is available to buy now on Collector’s Edition Blu-ray.